“Rattlesnake Roundups” are contests calling for hunters to bring in as many snakes as they can catch in a year, at which point the snakes are slaughtered and sold for skin and meat. Seven states still host these killing contests: Alabama, Georgia, Kansas, New Mexico, Oklahoma, Pennsylvania, and Texas. Nor do roundups protect public health. 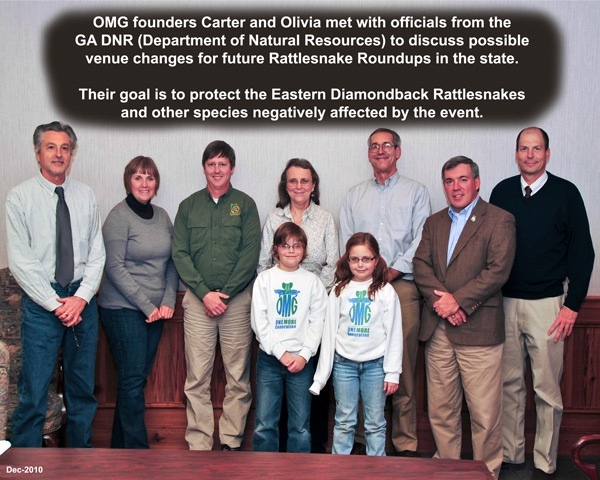 Roundup sponsors like to claim that the purpose of the events is to extract venom for medical purposes, but producers of rattlesnake antivenin have stated that venom from roundups is unusable and that they don’t purchase it. There are many more annual fatalities in the United States from dog bites, lightning strikes, and bee stings than from venomous snake bites. And in fact, the majority of snake bites occur when humans try to capture or kill snakes — so rattlesnake roundups themselves endanger public health by encouraging the public to do just that. Finally, roundups are far from necessary to generate community revenue. Many communities that used to hold roundups have successfully changed the focus of their revenue-generating annual events. For example, San Antonio, Florida transformed its roundup into a Rattlesnake Festival, which includes no collection contest or snake killings. And the town of Fitzgerald, Georgia replaced its roundup with a Wild Chicken Festival, which organizers say has been an enormous success. OMG is working with The Center for Biological Diversity to help protect rattlesnakes, gopher tortoises, and the 350 other wildlife species that are harmed by rattlesnake roundups. In early 2010, we asked Georgia Governor Sonny Perdue to outlaw roundups throughout the state, as well as requesting that Georgia’s attorney general investigate the gassing and destruction of tortoise burrows for rattlesnake roundups. “Roundups are senseless killing contests that need to be outlawed, but current Georgia state law which specifically exempts venomous snakes from any legal protection. Please contact Georgia Governor Sonny Perdue and your state senator and representative and ask them to amend state law and make rattlesnake roundups illegal. A sample letter is below. For more information, contact jim.ries@onemoregeneration.org. Later this year once the legislature is back in session; OMG will do a new alert asking folks to ask their reps to introduce the bill banning roundups. We are also working with the legal department of The Center for Biological Diversity to introduce new legislative language which would better protect the Rattlesnakes and hopefully end the roundups. Here is a Sample letter. Click on the link and print the PDF letter. Then just sign and mail accordingly.